A couple of years ago I went on a blind date (aka Tinder date). Obviously it didn’t work out since I’m single. It was mostly ok except for one thing he said that kind of irked me. We were talking about running. More specifically trail running, OSI. * Turns out my date was a fan of naked trail running. When he asked what I meant, I bluntly said it freaking hurts when I don’t wear the right sports bra while running. Things… bounce. Wouldn’t it be a similar situation for a dude? Dude’s response was that it didn’t bother him and then went on to say that that’s why most professional female runners were flat chested. Ok, yes, most of the professional (aka Olympic) runners I see are long and lean. But the way he said it was so definitive. As if me with my C-cups couldn’t be a real runner. Allie was a D-I athlete, and felt good about her body. She felt beautiful and curvy off the track, but often was greeted with disdain for her physique when it came time to run. 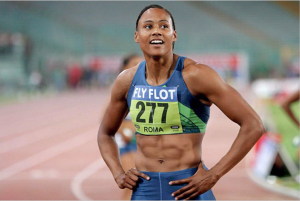 She succumbed to the external pressures and committed to cutting weight, but quickly discovered what many other elite athletes also discover when going down this road (pun not intended but appreciated): this is NOT healthy. Many athletes develop eating disorders, following coaches’ dictates that runners have to be as light as possible in order to win races. In Allie’s case, it resulted in injury that prevented her from competing in the 2012 Olympic Trials. Fast forward a few years and Allie is back to her naturally “strong” self and is crushing it! Remember all the hoopla a few months ago about Shalane Flanagan being the first American woman to win the New York City Marathon in 40 years? Well, Allie was right behind her. Just shy of three minutes behind her, to be precise. She finished fifth in the entire race, was the second American after Shalene, and PR’d by 26 minutes. Looks like being strong served her very, very well. This isn’t a skinny-bashing party by any means. Shalene and Allie are both inspirational runners in my mind! This is a celebration of strength of all kinds and individuality! I used to joke that I would put a picture of Gisele in front of me on the treadmill as motivation. The fact is that even at my most fit and most thin moments, I will never look like Gisele. Gisele and I are completely different people! Even though we both do yoga, box, and run. Our body types are just different, not to mention she has a foot on me in the vertical direction. It doesn’t make her a better yogi, athlete, or person than me because she’s long and lean. Around the time I was making this joke on the regular, circa 2007, I had a revelation. I got the flu and dropped weight really quickly. I remember my first day back to classes and catching a glimpse of myself in the mirror. I loved looking thinner! But then I couldn’t run for 5 minutes when I went to field hockey practice that night. I realized that I was a muscular fit person. I love running, and running gives me thighs and a booty. I made the conscious choice that I would rather be fit than thin. Thin or curvy, A-cups or DD, short or tall… We all come out of the womb with a genetic code that will determine a lot of our physical appearance. What we can control is living a balanced and healthy life! Training hard and being in shape for one person looks completely different than it does for someone else. Yogis are supposed to be long and lean, too? 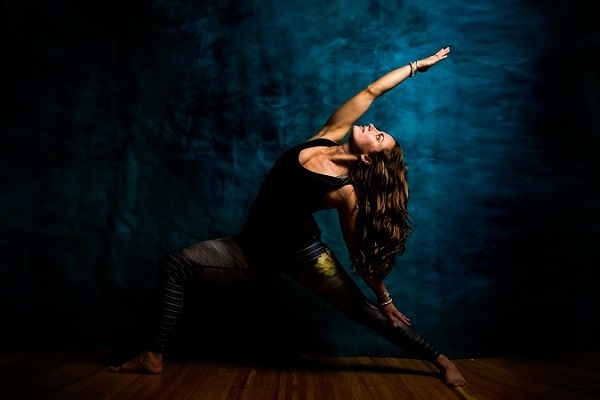 Jessamyn is rocking the yoga world by demolishing the body type stereotype. So in this year of being Limitless, I’m advocating for people not only accepting but absolutely owning and loving their bodies. Our bodies are capable of so much! Listen to them; they tell you what they want. Eat well. Healthy and balanced meals are imperative, but still indulge and eat deliciousness. You can’t perform if you’re starving yourself. And life is just better with some ice cream every now and then. It’s a fact. Train hard. (And rest hard.) For some of us, training comes a lot easier than resting. But your body needs rest, just as it needs the exercise, and overtraining is definitely a thing. I’ve come to discover my runs always feel better and stronger after a day or two off. Feel good in your own skin. Do what you do to feel your best self, not someone else’s. I love the way running and yoga and skiing make me feel (and I’ve definitely come to love my mountain booty). I don’t do them because I think it’ll help me look more like Gisele. Working on self-love and being the best and healthiest version of myself that I can is a big goal for me this year and during our Limitless campaign. Recognizing that I will never look like Gisele doesn’t impose limits; it frees up any energy I would otherwise exert toward an unattainable goal and lets me dedicate that towards a goal I can actually work to achieve. Recognizing that our body types do not define us is one of the biggest steps to self-love and confidence that a person can make. Join me on the journey! Join the #IAmLimitless challenge with Gixo and Fit Approach. We’re posting every Wednesday and Friday on @fitapproach to talk about all things badass and inspiring. *Our shared interest. Holla, New Girl fans! Schmidtty is the man! Disclaimer: This post was sponsored by Gixo. All opinions are my own. I truly appreciate all of the brands that support the Sweat Pink community. Amen, sister. I am ALL for being happy and fit in your own skin and not making comparisons or thinking thin is better. When I am too thin, I am not as strong. I like muscle and tone, it’s far sexier than skinny! I cannot say YES to this more! You are so incredibly strong (inside and out) and that is forever inspiring. It’s so clear that you are comfortable in your own skin and it translates as inspiration to others. So thank you. I love this post so much! You are beautiful and strong. As I age I’ve become more comfortable with my skin and what I see in the mirror. But that has been a journey in itself. And just so you know – you know amazing! LOVE this post, Liz. Love it so much. I spent so many years wanting to be YOUR body type – curvy and fit – and the closest I will ever get is when breastfeeding gives me a temporary boost. lol. May we all find happiness in our own skin! 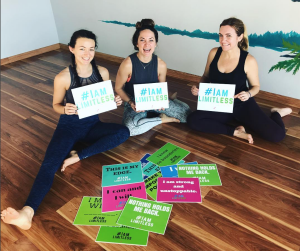 LOVE this post and the entire #IAMLIMITLESS message! YES — own your body and go out there and be whatever the hell you want to be regardless of your shape, size, height, color or gender! First of all you are so stunning inside and out. I love this post so much and my struggle with bodybuiding which is only about aesthetics and the most fit looking beautiful people have the worat body image. If we could just strive to be our best self at whatever we do we could be limitless. This movement is amazing and grateful for women like you sharing it.